Description : A leather zip travel wallet. 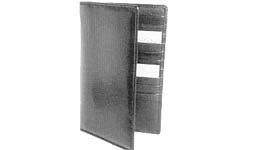 Inside, on both sides are two side pockets. The RHS has a flap pocket for the ticket and boarding pass as well as a pocket for the passport. The LHS has a zip pocket and another side pocket. 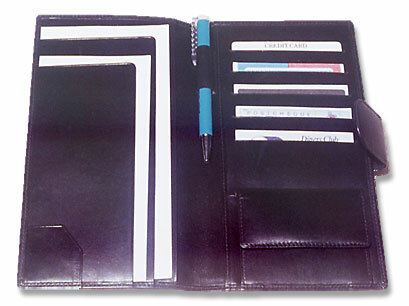 It also has 8 credit card slots and one net pocket for the visiting card. 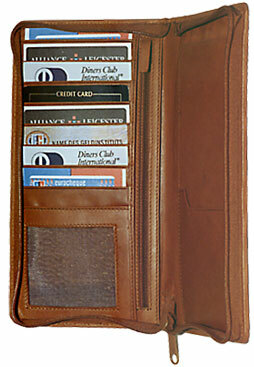 A travel wallet in italian leather. It is closed by a press button. Both sides have two side pockets. The RHS has a flap pocket, pocket for cards and a zip pocket for coins. 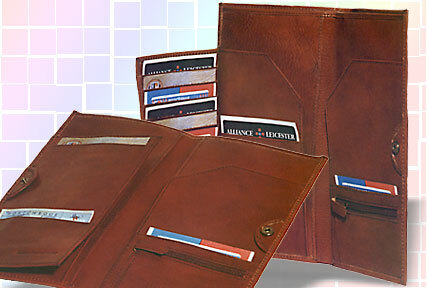 The LHS has one flap pocket with one pockets for cards and a deep pocket for keeping your passport. It has an open flap that has, behind it, 10 credit card slots. 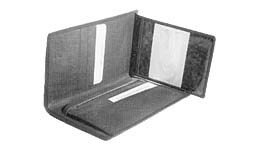 On top of this flap, a pocket for cards and a deep pocket for the ticket. Available in other leathers and the range of standard colours. A passport-size wallet for the men's breast pocket. There is a zip pocket in the centre and three side pockets on the LHS. The RHS has a side pocket and 10 credit card slots. This wallet can be made in any leather. An elegant leather wallet for the breast pocket or the briefcase. It has one deep note compartment. The RHS has a side pocket & a zip coin pocket. Stamps or papers can stay in the slot on top of the zip pocket. The LHS has a side pocket and 8 credit card slots plus a driving license window beneath the flap. It could me made from both Cow & Buff leather. A travel wallet in polished cow leather. The right side has 5 credit card slots and a coin pocket. On the left hand side are two flaps open from two sides for the passport, boarding pass and ticket. Both sides have two side pockets. It is shut by a tab and dome. Available in other types of leather as well in our range of standard colours.